Your mouthpiece is the most crucial element in the creation of your sound. Changing your mouthpiece from your starter mouthpiece is the most exciting and radical move. Make sure your ‘chops’ are strong and you are totally aware of the sound that is being produced. The mouthpieces we play and therefore recommend are: From America the metal or ebonite Otto Links and ebonite Meyers. The other one (if you can locate them) are metal British Lawtons. We will also discuss the top end Dave Guardalas too. If you are a beginner and struggling the very best beginners' mouthpiece is a Yamaha 4C. The Otto Link mouthpiece photos live and studio These are beautifully shaped gold metal and black ebonite mouthpieces. The sound of Otto Link is massive, gorgeous, sleazy and lewd. For an aural taste of its capability listen to any Ben Webster or Stanley Turrentine on metals or 'the beautiful sound' of Stan Getz on ebonite. 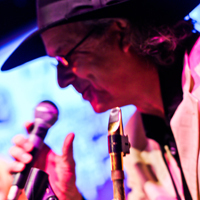 Blowout Sax's, Stan Scott, uses a 7* Metal Otto Link on his Borgani tenor (the Joe Lovano model). It offers a punchy, strong tone with plenty of warmth. 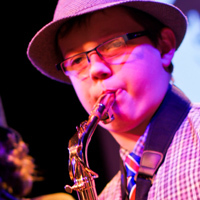 Stan reckons it provides more 'focus' and more 'top', making it the preferred choice in funk and similar genres, but that it is also the most versatile mouthpiece around. Craig Crofton, of Blowout Sax, uses an ebonite Otto Link 6* on his Yamaha YSS-475 soprano. Craig says the standard Yamaha mouthpieces aren’t bad but probably not loud enough. I have tried loads of metal ones with soprano - Otto Link metal, Lawton, Berg Larsen etc.. and have ended up believing soprano is best played with an ebonite mouthpiece. I now use an ebonite Otto Link 6* and am relatively happy with that. Craig says the Meyer is the perfect all round alto mouthpiece. 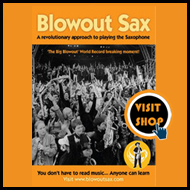 It is particularly good for students to start using when they have been playing the sax for over a year. 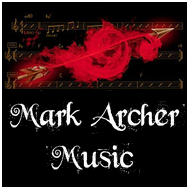 Its open bore design provides a fullness of sound and ease of playing that makes it a perfect choice. Meyers were used by the great Cannonball Adderley and Lou Donaldson. Craig, Stan & Berry all favour the Meyer ebonites on alto sax. Stan says the Meyer 7, which is one up from the Meyer played by the late great Art Pepper, is versatile with a full warm sound, as demonstrated on this live soundbite from Stan. Craig also says that you have to be careful if you are changing from an ebonite mouthpiece to a Lawton. It may take you several months to get used to it. You need to have your embouchure well developed to switch to all metal mouthpieces, and this is especially true of a Lawton. 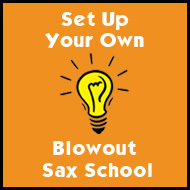 Blowout Sax’s Berry Goddard uses a Lawton 8*B mouthpiece on her Selmer model 26 tenor. Jackie Greenwood, of Blowout Sax, uses a Lawton 6 Star BB mouthpiece on her Yamaha YAS-62 alto. The original ones are no longer available new but can be found on Ebay. 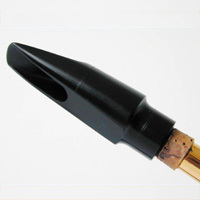 The other easier to obtain mouthpiece comparable to the Lawton is the Berg Larsen which Mark blew 30 years ago before the Peter Ponzol, which produced a searing powerful sound which is versatile for many types of music. Mark plays a Studio model on his Selmer Paris Mark VI tenor and a The King Dave Guardala on his Selmer Paris Series II. The relatively new King has a vibrant sound bright and warm. Craig uses an original handmade Michael Brecker Dave Guardala mouthpiece on his a vintage Conn Pink Lady 10 M tenor. This new Model is designed by Nadir Ibrahimoglu for the vintage sound. Trane has now the darkest sound of all Guardalas. It has tip opening 7* (106) a very large bore and a very small baffle. This mouthpiece combinates the “ Florida ” sound with the Modern Design of the Guardala Mouthpieces. Trane is for players who prefer the darkest sound with easy playing. Crescent model was designed with the “Coltrane” sound in mind. The sound of this mouthpiece is reminiscent of the John Coltrane album “Crescent” circa 1963. It features a slightly smaller tip opening (106) than other models. It had a large bore and a slight baffle. End of 80ies Dave designed for PMS a Crescent model with a little larger bore for the dark Bebop sound. This New Crescent model should be used by those players who prefer a dark sound. 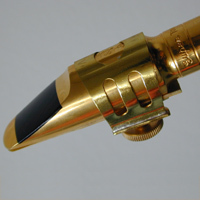 An exact replica of the mouthpiece played by Branford Marsalis, it has a large bore / chamber and a moderate baffle. It’s ideal for playing mainstream Jazz with the “harder” sound Branford is known for. MB (M.Brecker Mark I) (available only Handmade): This model is the exact replica of the mouthpiece that Michael Brecker used. This model incorporates a moderately high baffle with a large bore. It is less bright than the Studio Model but brighter than the Traditional Model. It should be used for the Mainstream Jazz. Tip opening 115” (8*). This new Model is designed by Nadir Ibrahimoglu for the ultimate Fusion Sound. It is a “Fusion” of the most popular Guardala Tenor sax mouthpieces: Studio + MB + MB II. The baffle is a combination of Studio and MB II, the chamber is a combination of MB and MB II. N.I.FUSION is available in three different tip openings: #7 (108”) , #8 (114”) and #9 (118”) and as LT Handfinished and as Handmade. This mouthpiece is perfect for Fusion-Jazz but can be used for Contemporary/Pop and Rock. (#116”)This is the third brightest of the Tenor models. It has tremendous volume with unexcelled resonance and a full and balanced frequency response. This model incorporates a high baffle with a medium bore. The sound of this model is clearly demonstrated by Michael Brecker in the period 1979-1982 ( Brecker Brother´s Band ). The Studio can be used for all types of music a “ Studio Man “ would encounter, from Fusion to Swing, hence ist name. This is our middle of the road mouthpiece. This mouthpiece is The King/R&B with a higher baffle. The chamber and the bore are altered to make a better match with the higher baffle. It should be used when the demands for brightness and power are extreme. It is ideal for Music that contains electric instruments that must be competed with, such as Fusion, and Rock’n’ Roll and Contemporary/Pop. This is the brightest of the Guardala mouthpieces. Tip opening is 119-120. BG produce black patches that some saxophonists like to put on their mouthpieces. The advantage is your two front teeth are then resting in the same place every time you blow - these are especially good for metal mouthpieces as the taste of metal on your teeth ain't always pleasant. Replace them when you begin to taste metal! Try different thicknesses to see what works for you. BG mouthpiece patches I’ve been getting from www.sax.co.uk.